There are numerous species of bees found across almost all continents. Bees are most attracted to flowering plants and all sweet smelling substances. Ideally, a bee repellent is a commercial product that protects you from bees. However, you can also come across various homemade remedies that could act as an excellent bee repellent. We wish to be happy and cozy in our own homes without being harassed by anybody or anything. Bugs too think the same way and what’s more, they think it’s their home where they have every right to live the way they like. They make our mattresses, cushions and couches their heaven. This gives rise to a conflict of interests and a state of cold war between us and the bugs, with the bugs adapting to guerilla warfare tactics of attacking, withdrawing and hiding. Lot of us just bear this in indignation and resolve to finish them off when we are badly bitten; but again slip into a state of non action because every time we make an attempt to get them, they somehow manage to withdraw into their hideouts and survive another day. Have we got to go on like this forever without bed bugs control? Definitely not; let us look at some foolproof ways of beating them or at least getting equal with them. The best place to start to get rid of bed bugs is from their most vulnerable point, which is their inability to withstand intense heat over 113 degrees Fahrenheit. You can take all the covers off your pillows, mattresses, cushions etc. where they have made their heaven; and put them out in the open sun to get baked, changing the sides at periodic intervals. Meantime you take the bare beds, chairs and other furniture from where they attack, also into the open and pour boiling water on them, targeting especially, the tiniest holes, cracks and other crevices etc. on them. Sometimes bed bugs control may involve more stripping of furniture like removing light plates and exposing the seams etc while ensuring the bugs do not escape from their hiding places. A more modern method of doing the same thing is by steam cleaning replacing the crude methods of pouring boiling water and putting things out in the sun to bake. However, unless you have the proper equipment for application of steam, you may have to hire professional pest exterminators. Once the bugs are all hopefully exterminated in a single holocaust, your next step is to prevent these unwelcome guests coming ever again to your home to claim their heaven at your expense and discomfort. When you travel, take care to keep your traveling bags and luggage away from furniture, beds and other possible places where bugs would have made heavens in other abodes where you take accommodation. If you had a bad experience of bug attacks at a place you last visited, on returning home and before doing anything else, take out all your clothes and wash them at the highest possible temperature, and give your traveling bags and luggage the steam treatment if you have one, or keep them in quarantine and put them out in the sun to bake at the earliest opportunity. 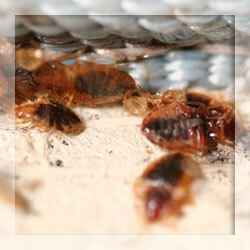 This is how you can get rid of bed bugs.